Prisons are for the working poor what colleges and universities are for the middle class: the institution that most powerfully defines life and death. As a weighty number of scholars, news reports, and policy papers have shown, those who are both poor and marked as black or brown are not merely more likely than the white poor to spend time in prison; they are also more likely than not to find themselves accosted by police, tripped up by law enforcement, or behind bars. Over the long 20th century, as the prison population exploded and became even more throughly racialized, prisons also became proving grounds for neoliberalism. Once run by states and counties, they are increasingly operated by private contractors, who enthusiastically quest (in the language of the business world) for new efficiencies and new profits in our confinement and erasure of the underclass. Harsh policing tactics, racial profiling platforms, anti-gang strike forces aren’t, then, merely “public safety” initiatives; they are harvests of a raw commodity for a new business sector. They can be shipped off to the the prison industrial complex, now cheerfully lauded as a “job creator,” and not a necessary evil, in many local communities. The idea of the prison has changed, too. If, once, prisons were thought to be reformist institutions, where isolation led to introspection and hard work led to self-respect, now they are simply warehouses for the human detritus produced by the global economy. No longer is chief aim of the structure to internalize the authority of the guard tower – a la Bentham and Foucault. Now, the goal is simply to methodically and inexpensively manage bodies removed from civil society, and to deploy them productively whenever possible. If you want the history of this, you can do no better than to read the works of David Oshinsky, Alex Lichtenstein, Ruthie Gilmore, Micol Seigel, Khalil Muhammad, and Heather Ann Thompson. Or turn to newer scholars like Dan Berger. Collectively, they reveal the grim arc of the prison, from Reconstruction to the present, from its never-so-innocent “reformist” beginnings to its current status as a black hole for the zombiefied poor. This history makes the Marion County Inmate Work Farm (MCIWF) all the more interesting. Stretched across the very middle of Florida, County Road 464 takes you from the mid-sized city of Ocala to the optimistically named, tract-house suburb of Silver Springs Shores. Somewhere in the middle, nestled at the intersection of two major roads and right up along the side of the road, a one finds the work farm. Rather innocently, it pushes up against a child day care and a coffee shop. Neatly planted rows of vegetables greet the eye. A low, wire fence marks its borders. A factory without walls, what strikes you most is how present it is, and how eagerly the place exposes its literal work to the public. The MCIWF is a recent invention. The original goal was to cut down on the food costs at the local jail. With this raison d’être in mind, the county used prisoners – cajoling them to use old fashioned tools to do the work – to clear cut a parcel of land. Now it uses them to grow and harvest the food they eat. It is a popular and successful initiative. 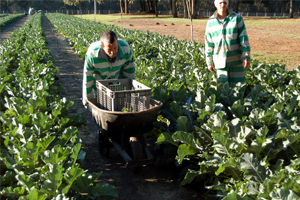 Some inmates from the MCIWF are loaned out to work on university projects at the agricultural extension campuses, and there are field trips for school kids. The farm is wrapped in the mystique of “can-do,” so that every success is aphoristically relayed to the inmates as proof that they, too, can be profitable members of civil society. Someday. The prisoners who work on the site are “low-risk” types who’ve volunteered for the job as a sort of re-training program. Enrolled at “the Culinary School of Arts of hard knocks,” as the county inelegantly puts it, they wear green-striped pants instead of aprons and the tall white hats of pastry chefs. “Unlike most culinary academies,” the county Sheriff’s Office says, “the inmates … literally learn the practical dynamics of producing prepared meals from the field to the plate.” Described most positively, this is life prep for low-wage work in the fields and the kitchens of the 21st century, barely adequate training for a new economic landscape where gutted cityscapes and food deserts require – as never before – community gardens and subsistence agriculture. In a certain way, the MCIWF should be paired with the creative displays of Sheriff Joe Arpaio, the living cartoon from Maricopa County, AZ, who likes to dress up his chain gangs in “ladies underwear” and pink shirts. Making punishment public and hard (or, at least, embarrassing) deters would-be criminals, Arpaio suggests. (Or at least, it encourages them to stay in nearby Phoenix). The point of the MCIWF, then, is to have the garishly striped bodies of prisoners on display at the edge of the road, as advertisements for an ethos of improvement and cost-sharing. In the MCIWF, the object lesson is different: black and white, working together, being productive, all in front of the speeding public. Eating organically grown produce, as if they had just come from Whole Foods. It is a feel-good image, distracting us, hiding the old paternalist model of corrections in which the ritual display of power and authority – the shotgun-toting deputy on horseback overseeing the chain gang – was required to shore up civic confidence. The food is good, we are meant to say, and the work is job-training. The inmates volunteer for the gig. This is a reform aimed at the hearts and minds of law-and-order liberals, not sunbelt conservatives. What strikes me, again, is how available it is for critique. It isn’t hidden behind walls or isolated in the deep country. A thousand people go by it – go through it – every day. All of them are visitors to a living diorama, a neoliberal model of prison reform.